Charting the transformation of Vladimir Putin from a passionate fan of the West and a liberal reformer into a hurt and introverted outcast, All the Kremlinâ€™s Men is a historical detective story, full of intrigue and conspiracy. This is the story of the political battles that have taken place in the court of Vladimir Putin since his rise to power, and a chronicle of friendship and hatred between the Russian leader and his foreign partners and opponents. Russia's most prominent independent journalist Mikhail Zygar has had unprecedented access to people who are either currently or were formerly allied with Putin, but have only now agreed to reveal their impressions of the powerful president and his circle of power. Zygar's in-depth interviews include Putinâ€™s press secretary Dmitry Peskov, Deputy Prime Minister Igor Shuvalov, former finance minister Alexei Kudrin, former Kremlin chief of staff Alexander Voloshin, former mayor of Moscow Yuri Luzhkov, former presidential candidate Mikhail Prokhorov, opposition leader Alexei Navalny, former mresidents of Ukraine and Georgia Viktor Yushchenko and Mikhail Saakashvili, and many other key Russian and Western politicians and diplomats. For many people from Putinâ€™s closest circle, it was the first time they could tell their stories. 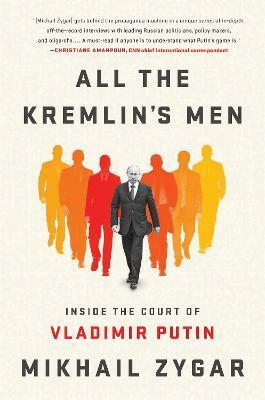 Each chapter has a main character, who gives an insight into the origins of Vladimir Putinâ€™s transformation. Cumulatively, All the Kremlinâ€™s Men explains to the English-speaking audience what has happened to Russia, what the role of the West is in its destiny, and how this destiny could play out going forward. It is a delicious portrait of the strangeness of modern Russia, a country swirling with intrigue and paranoia, peppered with fateful missteps and confusion, and the brooding, volatile, magnificently unpredictable figure of Vladimir Putin.